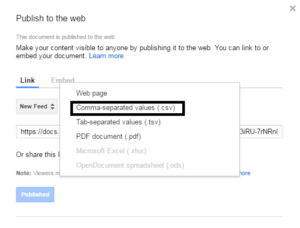 Google spreadsheet allows importing data from a given URL in various structured data types including XML, HTML, CSV, TSV, and RSS and ATOM XML. There are different formulas to import each type: IMPORTDATA(): It imports data at a given URL in .csv (comma-separated value) or .tsv (tab-separated value) format. IMPORTFEED(): it imports a RSS or ATOM feed. 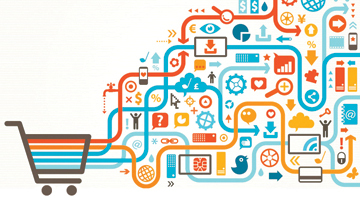 IMPORTXML(): it imports data from XML file online. In our example below, we used IMPORTDATA(“URL”) since our feed is in a CSV format. Once you apply the relevant formula on the relevant feed, you will see the status “Loading” in the formula cell until all the info is completely retrieved from the URL. 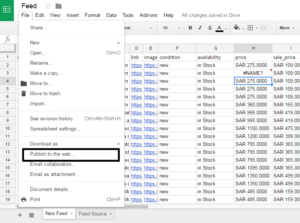 You need now to create a new sheet inside the same spreadsheet and look up your feed source data in the new sheet. Applying changes in a different sheet are much easier than implementing changes directly on the same source sheet. So, Let’s say you want to change the currency of the current feed from USD to EUR. All you have to do is to add a new column with the new currency and remove the old currency column. Secondly, you multiply your currency price to either a fixed currency exchange rate or you use GoogleFinance() formula to pull in an exchange rate from real-time internet data, so calculations can always be up to date without having to look up an exchange rate. You can start to apply all the changes you want in your new feed sheet, these changes will happen in parallel with the changes happen in your main source feed as we are using a real-time formula to import the data to our spreadsheet. This means any changes happen in the source/bridge feed, will be reflected right away in our new feed. 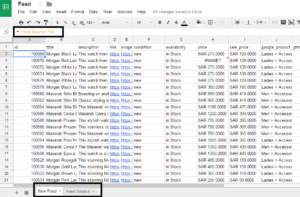 By default, Google Merchant Center allows fetching feeds from Google spreadsheets. 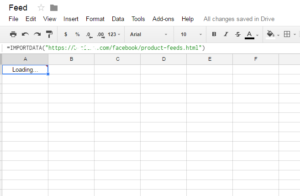 When you upload your feed, you select Google sheets as can seen below and you pick your feed sheet. Then, make sure to publish only your new feed sheet in CSV or TSV format as you can see below. Finally , you can copy the given link and submit to Facebook. There might be some limitations to this method. For instance, your feed could be so large, therefore you won’t be allowed to import the data into Google spreadsheets as it exceeds the max available size. That being said, I believe this method is still effective for many of us who want to optimize their feeds in no time and accelerate the growth of their AdWords and Facebook campaigns. Please share with me your XML feed URL in a private message via the “Contact Me” page and will see what we can do. 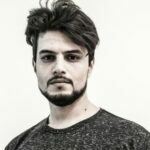 When publishing a feed to the web, are there any concerns regarding the security of the information being passed along in the feed? Do the sharing setting applied to the published feed still apply?